With a minimum investment of time and money, you can add significantly to your video income by offering video duplication. I’ve always said that owning and operating a duplication system -whether it’s for CDs or DVDs –is like having a license to print money. Let me explain. 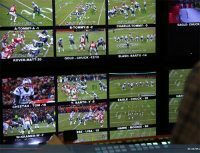 My former company, Great Lakes Video Services, operates in a fair-sized Midwestern city where producers and production houses abound. Very few of those tunnel-vision competitors bother to do their own in-house duplication. I’ll tell you who wants to pick up “a couple bucks” here and there. Having a duplication system is like having a license to print money. (Whoops, I said it again.) I know that for an absolute fact. For the first four years in business, we grossed an average of $100,000 a year just for our duplication services. Today, under the management and ownership of my daughter, Great Lakes’ duplication rack grosses over $15,000 a month. Now that’s SERIOUS money. –you should be in the duplication business. -you should be in the duplication business. you should be in the duplication business. Bottom line: if you’re NOT duplicating your productions, or offering these services to people who want copies of their own tapes or discs, you’re losing the opportunity to make a large amount of money. With a minimum investment of time and money, you can add significantly to your video income by offering CD and DVD duplication! A customer walks in, or calls you. They’ve got a one-hour video and need 10 DVD copies. You sell them on using your duplicating services, and they book the order. You receive the tape, and after printing the DVDs you put them in your dupe tower with 8 burners, you load all eight with blank DVDs, put your system to work, and walk away from it; there’s other paying work to be done! An hour later, you take a break from your current editing chores, stroll over to your dupe tower. The DVDs are done. You quickly check your work to make sure all DVDs are recorded properly, and put them in the printer. Since you need a total of 10 DVDs, you load in two more blank DVDs, start the master and begin recording. An hour later, you come back over to your tower, and check your work. All’s well, so you package up the order and let your client know his or her job is done. For those few minutes of actual work, you charge your client $15 a DVD. Not bad for about 15 minutes of actual work, is it? There is a surprising demand for this simple work since so many want to transfer VHS tapes. I would like more information on how to create my small company, the equipment and software needed and the Company to buy all the equipment and materials too start my Duplication system from VHS to DVD or to DVD to DVD, Thanks for your help, Pedro Juan Santiago, Media Specialist. Thanks for your comment. Our new product about the duplication business is in the works. We’ll announce it on this page when it’s available. I would like more information on starting a DVD/CD business. What programs are involved and what can be done. I am seriously interested in starting my own business. Thank you. I sent you an email about our program. I hope it was helpful. I work with media at my church and do small duplication runs each week. I also have a full-time job with long hours that i’d like to walk away from. The duplication business sounds like a great idea. I’d be interested in learning more. Thanks! 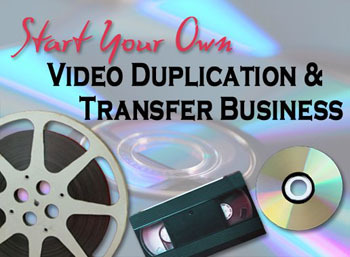 “Start Your Own Video Duplication and Transfer Business” is finally available! I can email it to anyone who needs it for $49.95. Like all of our products it comes with a 90 day Money Back Guarantee. Where have you been. I have been looking for help to do something like this for awhile. Thank you for all the information.